Student Picture. When a user processes student information, the app user as well as the proscanner.org user will have a picture come up of the student just as seen below. This is a great way to verify the student. Many schools have asked for this feature and it’s now available. SSICA Kiosk. Install a kiosk at your school to process attendance, tardies and so much more. You can use a kiosk with a Surface Pro 3 or an iPad 12.9. 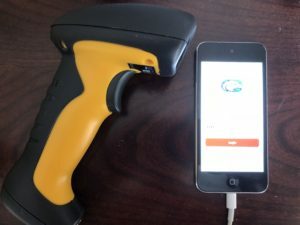 You can use the camera on the device to process ID cards or for faster scanning, you can use a Bluetooth scanner connected to the Kiosk. With the Surface Pro 3 kiosk you can also connect a thermal printer to print classroom passes. RTI, Support Period, or Access Period. As many of you know, RTI or the support period for the student can change on weekly bases because the needs of the student changes. Some schools have a special bell schedule to support RTI or the support period. How would teachers use SSICA? When a student arrives to the classroom for support, the teacher would scan the ID card or process the student’s information using SSICA. If the student supposed to be in that classroom, the scan result will be Green. 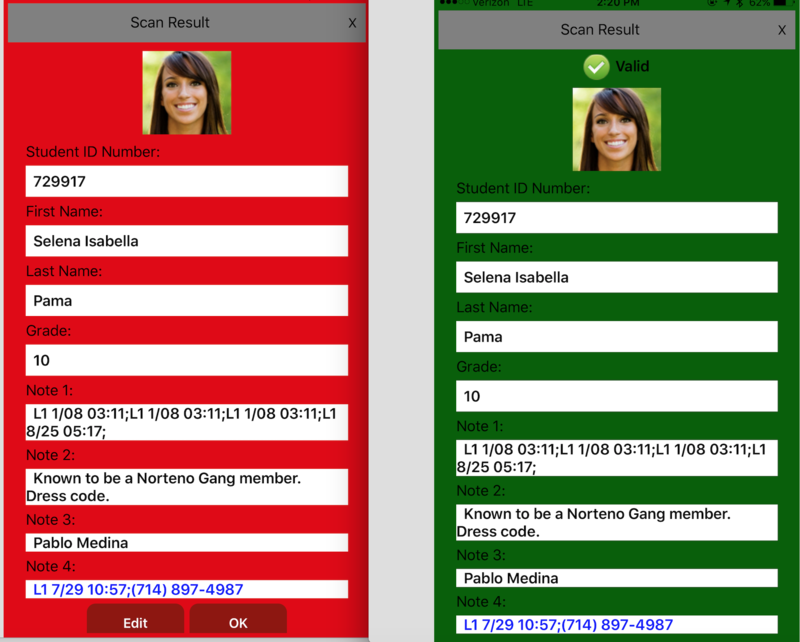 If the student is not supposed to be in the classroom, the scan result will be Red. The teacher at this point would look at the scan result and tell the student he needs to go to Mr. Bello’s classroom for support because a Note would give this information to the person scanning. Only the students that are suppose to be in the classroom will come up Green on the scan result and all other students will come up Red. To scan 30 students into the class the teacher would take about a minute. Admin would get a report of all students that made it to the RTI or support period and the report will also tell admin who didn’t make it to the support period. The report is available immediately after teachers are done scanning. The team can check when the bell rings and see who didn’t make it to their class. 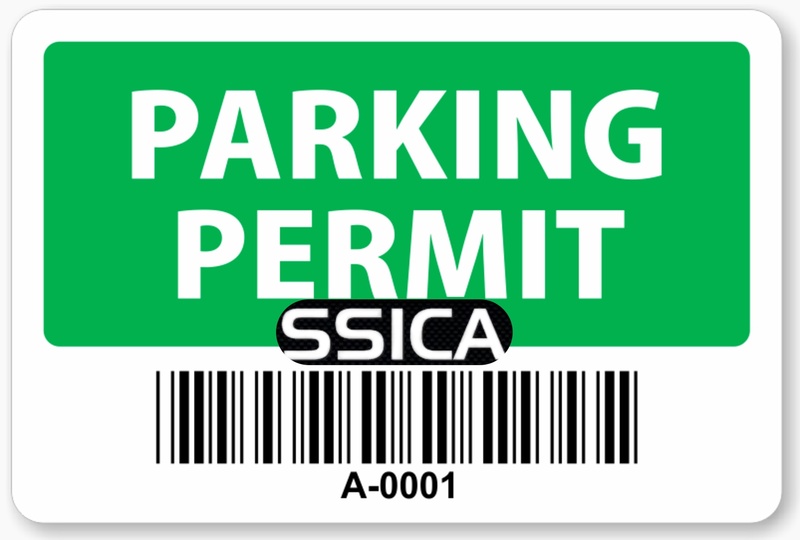 SSICA will also provide a “Status Check” Button. This Button would be used for staff to check a student and see what class he is supposed to go to. This is great for campus supervisors, security and admin that are escorting students to the support period. 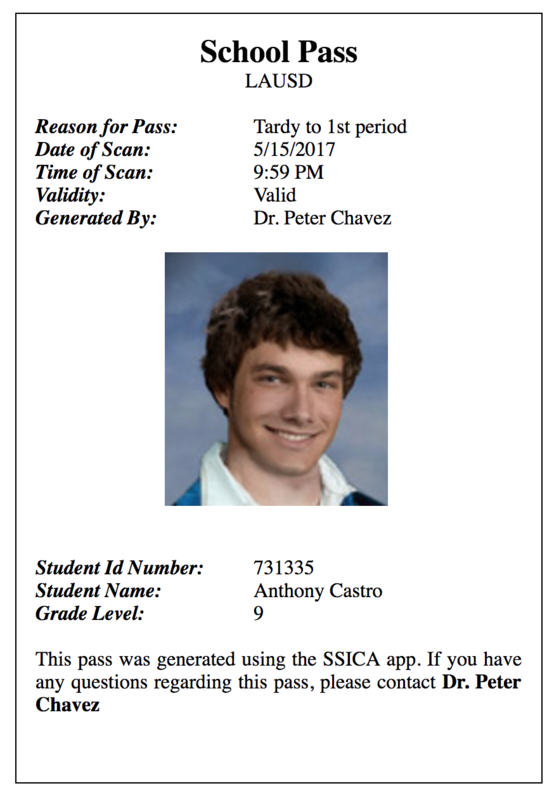 How does SSICA know what class the student needs to go to? SSICA gets this information from the SIS system. As long as your SIS is updated with the support period each student is required to attend, SSICA takes care of the rest. Scan using a Scanner Gun. 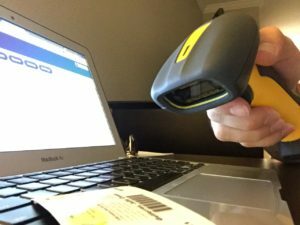 Staff can also use a scanner gun to scan ID cards using their PC, Mac or Chromebook. This works great with Proscanner.org. I recommend the scanner gun for low light areas or when scanning ID cards speed is critical. Validate Parking. You can use the SSICA app to validate cars for either students or staff. 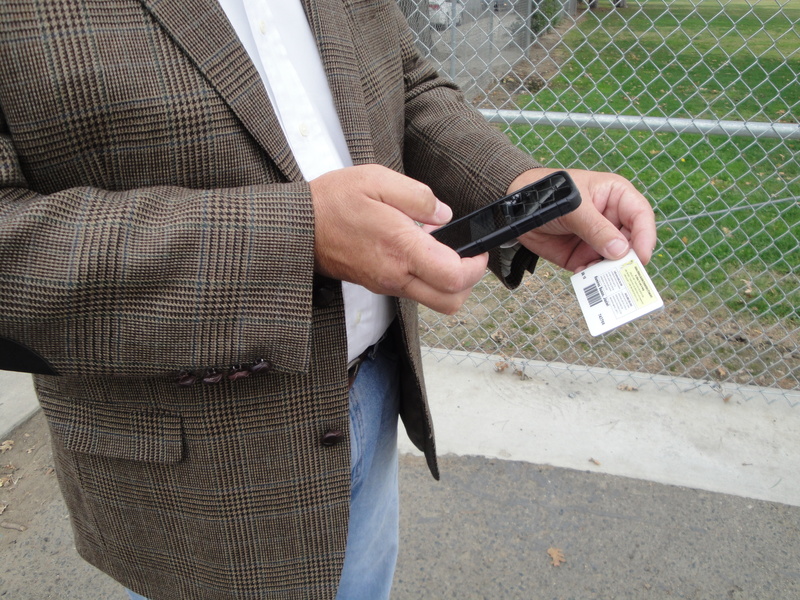 All you do you scan the ID permit to see if the car is authorized to park there. If it comes up Green then the car is allowed to park there. If it comes up Red the car should not be parked there. 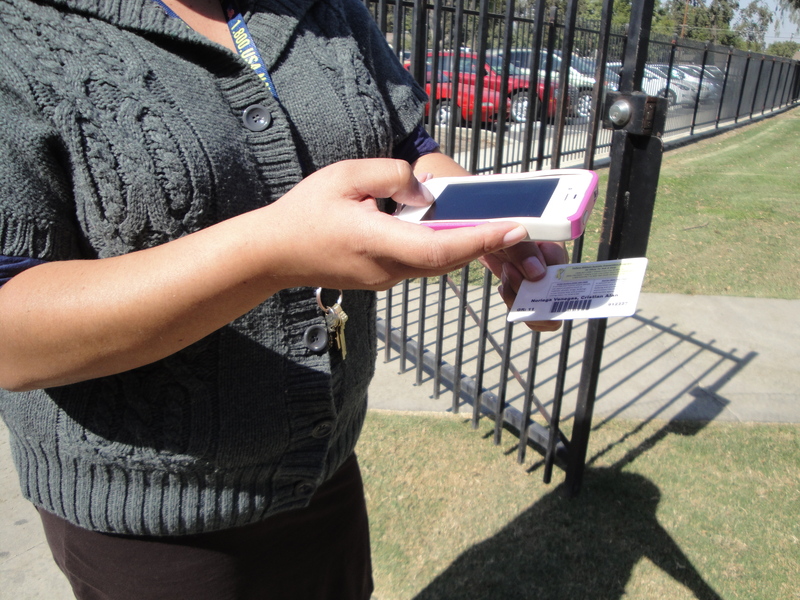 You can also scan the barcode when students are leaving campus. The uses are endless! School Passes. 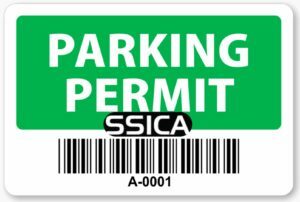 SSICA can now generate passes using Proscanner.org. This great for Attendance or teachers in printing passes for students. How does it work? 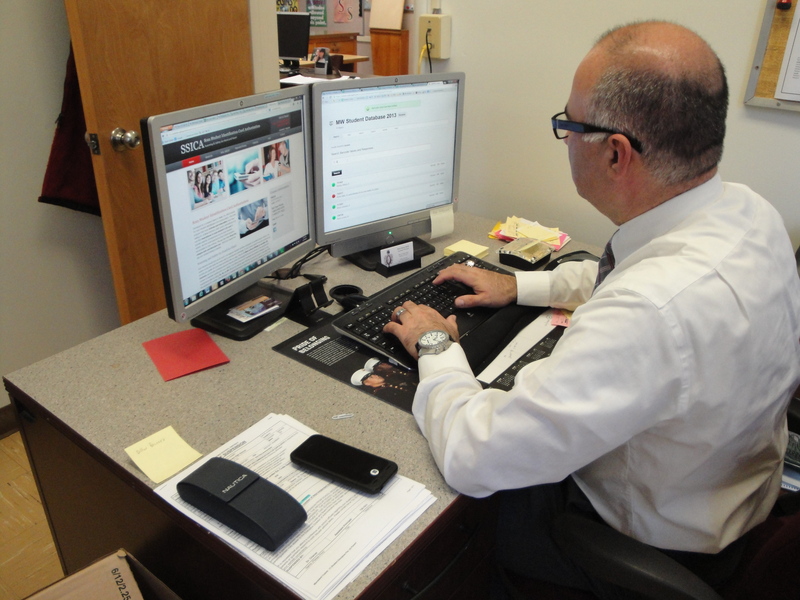 The staff members scan the ID card and then the user clicks on “Print Pass” from the result. This is how the Pass will look like. It includes the student’s picture since substitutes don’t know all of the students in the classroom. Location. This is a great way to find the exact location of where the scan took place. 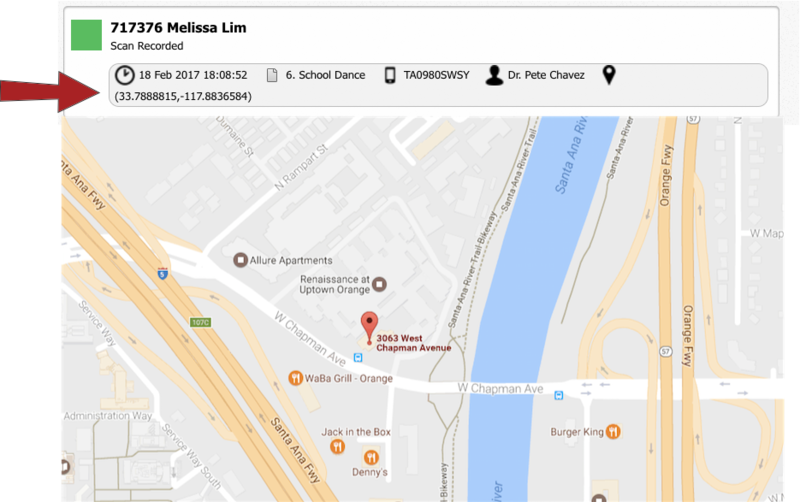 All the administrator of ssica.org needs to do is go into Scans for Today, locate the student and click on coordinates and a map opens up where the student was processed. This is great in so many instances. For example, this is great for Bus Transportation. Let’s say your bus drivers are scanning the students exiting the bus. A principal calls your dispatcher asking if Melissa Lim made it home. The dispatcher would simply to go to Scans for Today in wwww.ssica.org, search for the student and click on the coordinates. 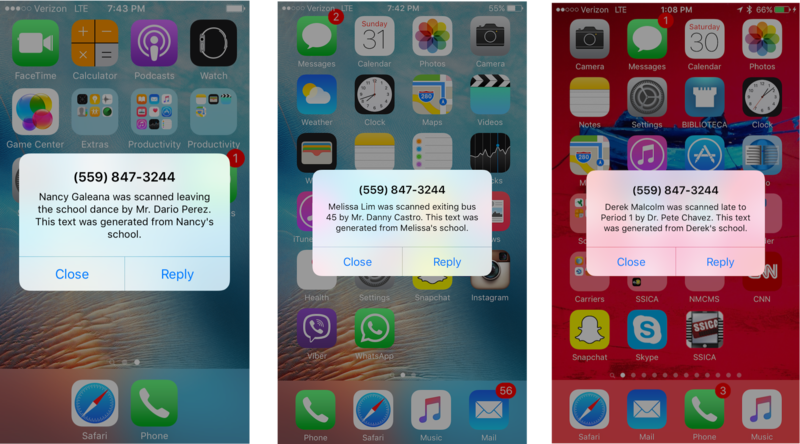 Your dispatcher will be able to provide the date, time, and the exact location the student was dropped off. Since teachers need to communicate with parents/guardians sometimes in groups of students, SSICA has the capability to send multi message at once. Let’s say you have 15 students in your class doing a great job and they are working on the assignment and you would like to let their parents/guardians know that they are on task. 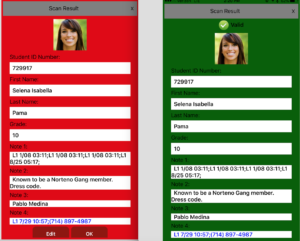 Simply go to Proscanner.org, click on the correct Button for positive behavior and enter the ID number of the students and click “Submit”. 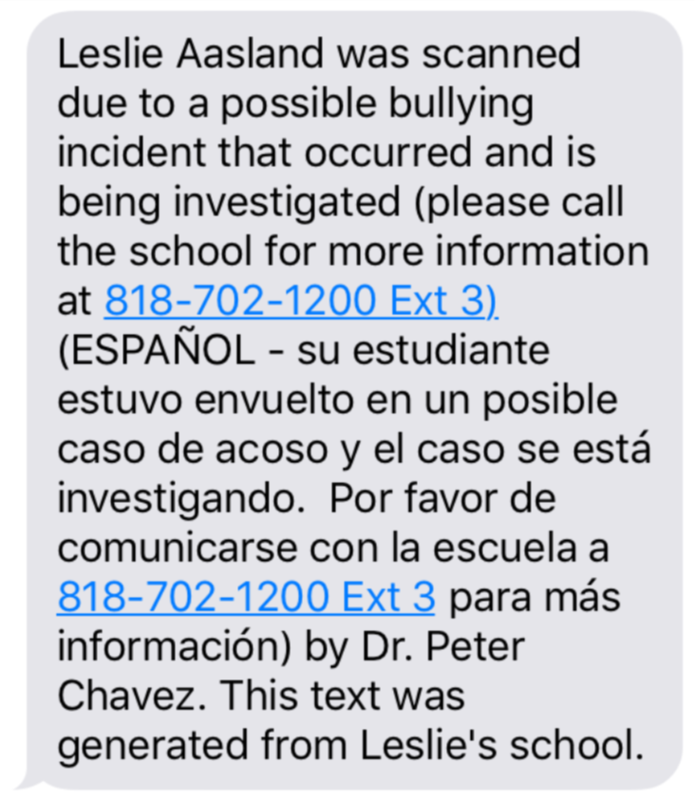 You have now sent 15 text messages and emails to parents/guardians notifying them that their child is doing a great job in the classroom. 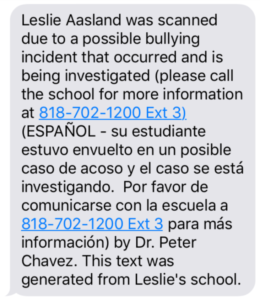 Keep in mind that each text message would go out customized with student name, the reason why they received the message and the name of the teacher. 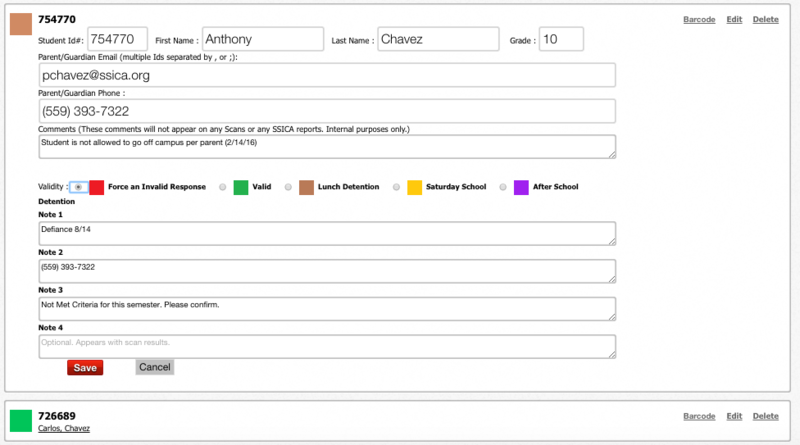 SSICA can connect to Student Information Systems like Aeries, PowerSchool, Infinite Campus, and other programs used by schools. 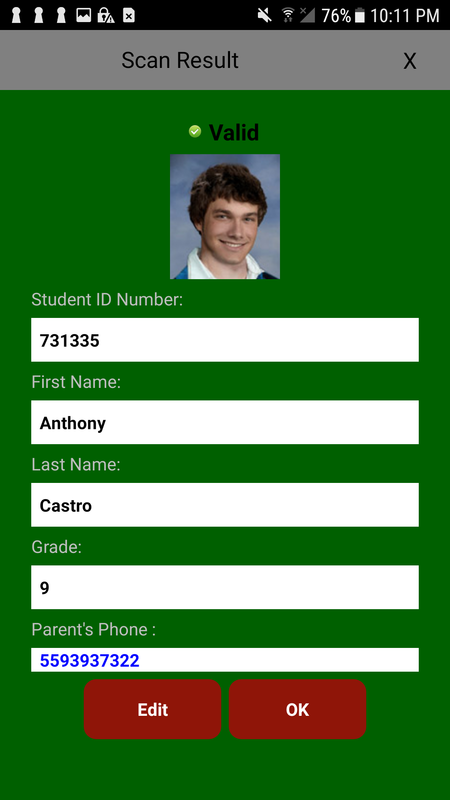 As long as the program has an API or the district is willing to use an FTP, SSICA can connect to your school program keeping up to date SSICA with new students, update phone numbers, and drop students that have been withdrawn. 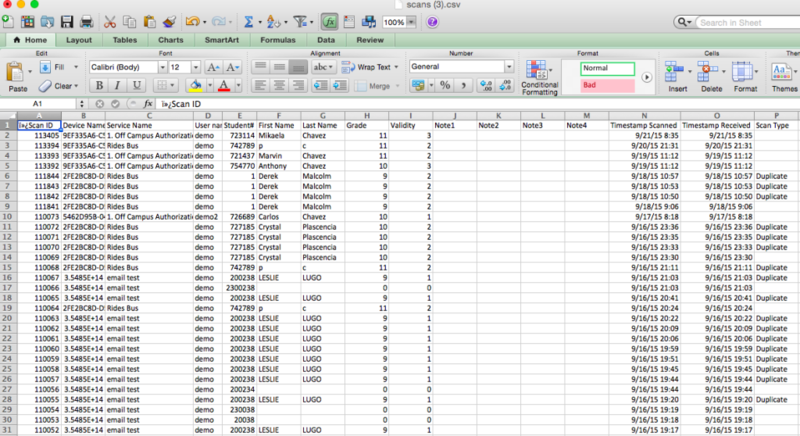 This makes SSICA a very valuable app to any SIS system that provides an API or a district willing use an FTP. SSICA Rosters can now connect to Google Docs. This is great because maybe your SIS can’t compute special formulas (like GPAs) but you can do this using Google Spreadsheets. 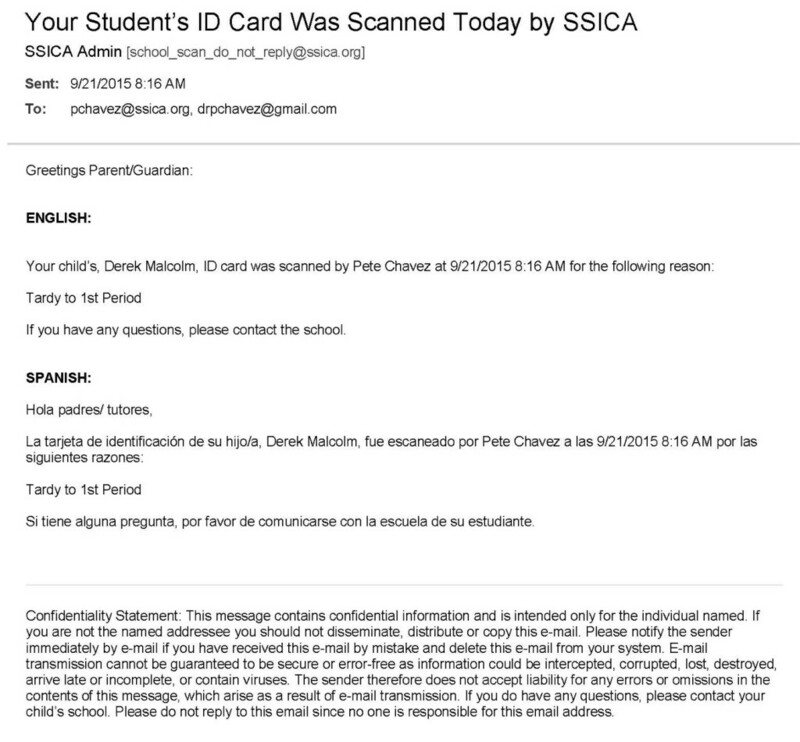 SSICA can connect to your Google Doc and upload information to SSICA at 7:45 am, 11 am, and 2 pm. SSICA can also change the Validity (color) and do much more. We can provide Tech Support to Schools that need help in connecting SSICA to your SIS. We can even provide script or code that would allow SSICA to obtain vital information from your SIS and upload data to your SIS at an additional charge. We can also provide IT Services for other areas that you may need support like in creating programs for other programs you are currently using and creating new apps (i.e. iOS, Android, Windows and browser based programs) for your school or district. With experience in many SISs and IT education, it’s a win-win situation for any school or district needing support in these areas. We will then submit your app for patent utility and to all stores. Give me a call for a quote. Data security is one of our number one priority. We are compliant with HIPAA and FERPA and use a number of security protocols to ensure your data is 100% secure in SSICA. Our program works on both Android and iOS phones and we are ready to offer this service to schools nationwide. Give us a call anytime to get more information about SSICA at (559) 393-7322 or email Dr. Chavez at pchavez@ssica.org.